The Justinian Society and Foundation honored Lisa Scottoline, former <?xml:namespace prefix = st1 ns = "urn:schemas-microsoft-com:office:smarttags" />Philadelphia attorney and best-selling author of Daddy’s Girl, Dirty Blonde, and Devil’s Corner on October 11, 2007 at the Union League of Philadelphia. Scottoline was introduced by Brad Segall of KYW Newsradio 1060. 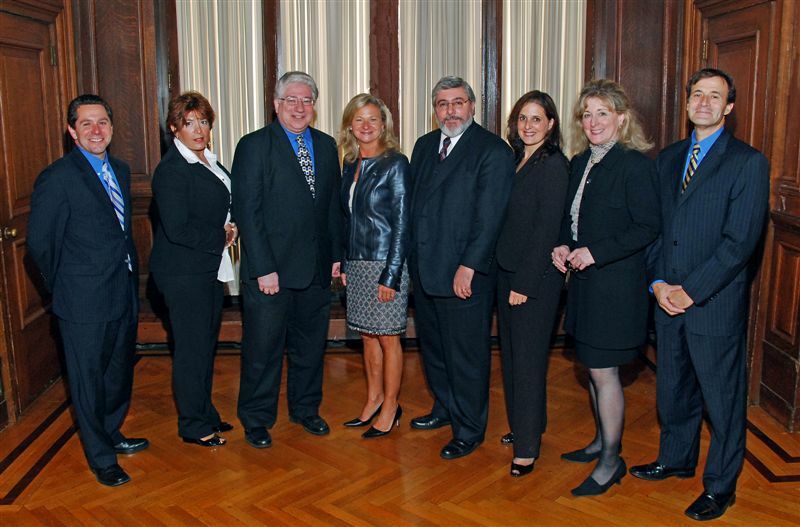 Pictured from L to R: Gino Benedetti, Justinian Society Treasurer and Partner at Dilworth Paxson LLP in Philadelphia, Barbara Capozzi, President of the Justinian Foundation and owner of Capozzi Real Estate/Insurance, LTD, Brad Segall, Suburban Bureau Chief of KYW Newsradio 1060, Lisa Scottoline, Rudolph Garcia, Justinian Society Chancellor and Shareholder at Buchanan Ingersoll & Rooney PC in Philadelphia, Gina Furia Rubel, Justinian Society Vice Chancellor and President/CEO of Furia Rubel Communications of Doylestown, Pa., Roberta Pichini, Justinian Society Secretary and Partner at Feldman, Shepherd, Wohlgelernter & Tanner of Philadelphia and Gaetan Alfano, Justinian Foundation Secretary/Treasurer and Partner of Pietragallo Bosick & Gordon of Philadelphia.